Traveling to space is difficult and extremely expensive. Even transporting something as simple as water to space is very costly. However, that could change. Recently, high abundances of hydrogen-rich molecules and possibly even water have been discovered on the Moon by NASA’s Lunar Reconnaissance Orbiter (LRO). This type of discovery is vital for the future of space travel as lunar water could be used for drinking, or could even be broken down into its constituents — hydrogen and oxygen — to produce rocket fuel or even breathable air. LRO has been in orbit around the Moon since 2009, beaming back data and images including a 3D map of the lunar surface. Recent observations made by LRO indicate that deposits of hydrogen-rich molecules may be more abundant in cratered slopes located in the Moon’s southern hemisphere. “There’s an average of about 23 parts-per-million-by-weight (ppmw) more hydrogen on Pole-Facing Slopes (PFS) than on Equator-Facing Slopes (EFS),” said Timothy McClanahan of NASA’s Goddard Space Flight Center in Greenbelt, Maryland. This discovery marks the first time a widespread geochemical difference in the abundance of hydrogen between PFS and EFS have been detected on the lunar surface. The difference is equivalent to a one-percent difference in the neutron signal detected by LRO’s Lunar Exploration Neutron Detector (LEND) instrument. The hydrogen-enriched material is extremely volatile, meaning it vaporizes easily, and can be found in two different varities — two hydrogen atoms bound to an oxygen in the case of water molecules, or one hydrogen atom bound to one oxygen atom in the case of hydroxyl molecules. The difference in hydrogen atoms detected between PFS and EFS could be attributed to the same process by which the Sun redistributes frozen water from warmer to cooler places here on Earth. Greater hydrogen abundances were observed on PFS in the Moon’s southern hemisphere from a south latitude of 50 and 60 degrees, while slopes located closer to the South Pole show a greater difference in concentration. On the larger PFS, greater concentrations — around 45 ppmw — of hydrogen was detected. Spatially broader slopes provide more detectable signals than smaller slopes, thus indicating PFS have greater hydrogen concentrations than the surrounding regions. The team thinks more hydrogen may be found on PFS in northern hemisphere craters as well, but they are still gathering and analyzing LEND data for this region. For decades scientists have estimated that permanently shadowed cratered areas near the lunar poles were the only locations where it was cold enough to find concentration of the hydrogen-rich material. However, thanks to LRO and other spacecraft, we now know that hydrogen is more widespread. 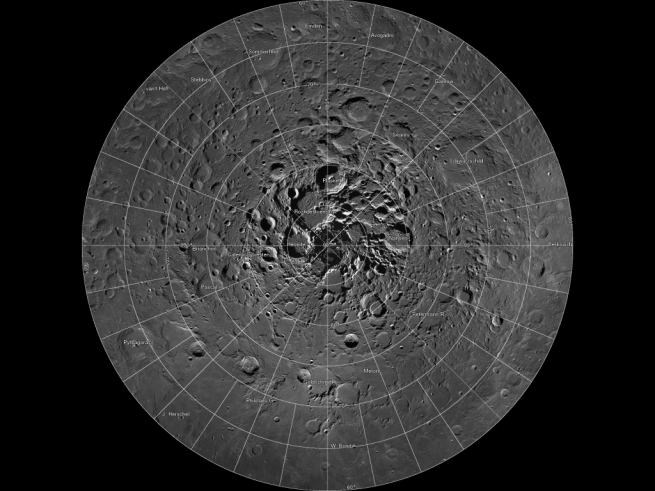 Mosaic of Lunar North Pole taken by the Lunar Reconnaissance Orbiter Camera. Scientists hope to find same hydrogen abundances on PFS in the northern hemisphere as they have in the southern hemisphere. So where did the hydrogen deposits come from? One possibility could be from impacts with cosmic bodies such as comets or asteroids, and they both contain large amounts of water. Another possibility is the hydrogen-bearing molecules could actually be produced on the lunar surface as a result of interactions with the solar wind. Solar wind is a stream of gas that is continuously blown off the Sun. Comprised of mostly hydrogen, the solar wind can interact with oxygen locked in silicate rock and dust on the lunar surface, ultimately creating hydroxyl and even water. After forming, they are energized by sunlight and then scatter across the lunar surface, eventually collecting in colder, shadowy regions. Not enough data is available currently to determine whether or not the hydrogen can be mined. With the help of LEND’s high-resolution, we may be able to definitely determine where the highest abundances of hydrogen concentrations are and if there is any potential for mining. 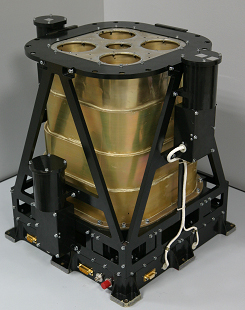 The LEND instrument works by counting the number of neutrons bouncing off of the lunar surface. The neutrons are produced when the lunar surface is hit with cosmic rays, which are high-speed particles flying through space and are produced by cosmic events like solar flares or supernovae explosions. Cosmic rays shatter atoms in material near the lunar surface, generating neutrons that bounce from atom to atom like a billiard ball. Some neutrons happen to bounce back into space where they can be counted by neutron detectors. Neutrons produced by cosmic ray collisions come in different varieties and travel at different speeds. Hydrogen atoms are incredibly efficient at stopping medium speed, or epithermal neutrons, in their tracks. Collisions with hydrogen atoms in the lunar regolith reduce the numbers of epithermal neutrons that fly into space. The more hydrogen present, the fewer epithermal neutrons the LEND detector will count. LEND detected a widespread decrease in the number of epithermal neutrons and the team was able to interpret that to mean a higher abundance of hydrogen is present on PFS. 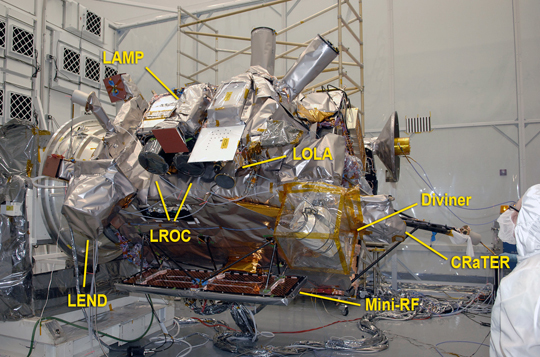 They then combined the LEND data with lunar topography and illumination maps from LRO’s Lunar Orbiter Laser Altimeter (LOLA) and with temperature maps from LRO’s Diviner Lunar Radiometer Experiment (Diviner) to ultimately discover the greater hydrogen abundance and associated surface conditions on PFS. The team cannot wait to see if the same patterns discovered in the southern hemisphere also exist in the northern hemisphere, as well as see how the hydrogen abundances change from day to night. If the same pattern is present and there is a change in hydrogen abundances it would confirm existing evidence that there is an active production and cycling on hydrogen on the lunar surface. The research was funded by NASA’s LRO mission. LEND was supplied by the Russian Federal Space Agency Roscosmos. Launched on June 18, 2009, LRO has collected a treasure trove of data with its seven powerful instruments, making an invaluable contribution to our knowledge about the Moon. 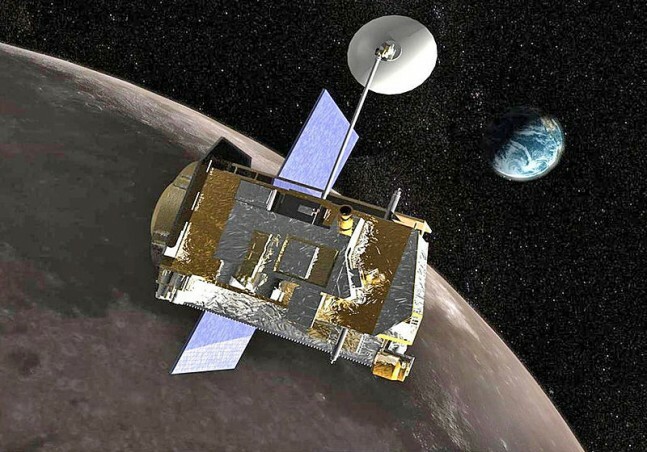 LRO is managed by NASA’s Goddard Space Flight Center in Greenbelt, Maryland, for the Science Mission Directorate at NASA Headquarters in Washington.